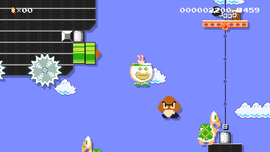 Nintendo Badge Arcade is an Event Course in Super Mario Maker based off of Nintendo Badge Arcade, released on December 17, 2015. It unlocks the Arcade Bunny Mystery Mushroom costume upon completion. The level begins with conveyor belts and a warp pipe spitting out Mystery Mushrooms. It leads to a segment with lifts, along with a conveyor belt segment that has Mario avoid Grinders, followed by a Spike Top, and warp pipes spawning Big Goombas and Big Koopa Troopas, which leads to a warp pipe. Mario then enters a Koopa Clown Car, and must use it to navigate hordes of big enemies bouncing on Note Blocks and Chain Chomps. A P Switch is approached, and Mario must press it and continue to a section with three warp pipes; he must take the rightmost one, which leads directly to the Goal Pole. Hey there! Welcome to the Nintendo Badge Arcade! It's the place to be if you want to play crane games and catch badges you can use to jazz up your HOME Menu. ...HUH?! The arcade got turned into a Mario course?! Ooh, I hope the boss approved this, or I'm gonna be in big trouble! Bajji Tore~ru Sentā The Japanese name for Nintendo Badge Arcade, "Collectible Badge Center". This page was last edited on August 31, 2018, at 23:03.